What if your human parents were violent, deceptive, cold, or even just occasionally disappointing? 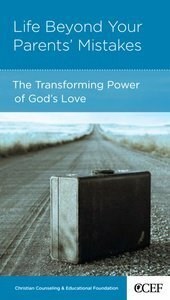 Can their failures keep you from understanding God's love and having a growing relationship with your heavenly Father? Some say that you can't know God's love unless someone will stand in your parents' place, giving you a loving new image to use in relating to God. But is this true? David Powlison speaks compassionately to those who are disappointed by their human parents, and he uses God's Word to show that our parents' mistakes cannot stop us from knowing God and his unfailing love. Using case studies from his extensive counseling experience, Dr. Powlison explains how turning to God for mercy and help will transform your life and your relationships. About "Life Beyond Your Parents' Mistakes (Christian Counselling & Educational Foundation Series)"
Powlison is the editor of the Journal of Biblical Counseling and a member of the faculty and counseling staff at the Christian Counseling and Educational Foundation in Glenside, Pennsylvania.